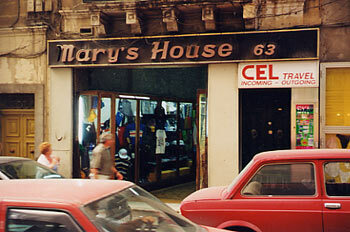 Mary's House, the store where clothing was allegedly purchased and placed in the brown Samsonite suitcase which held the bomb. The key physical evidence purportedly linking the two defendants to the bomb is a scrap of clothing found in Lockerbie. Forensic scientists determined the clothing fragment was part of a pair of men's checked, brown trousers. That garment, they found, was packed along with other clothes in the brown Samsonite that held the bomb. A fragment of a tag showed the trousers had been purchased at Mary's House, a small shop on a narrow street near the seaside in Sliema, Malta. We went to ask the proprietor of Mary's House, Tony Gauci, who bought those trousers, but Gauci long ago grew tired of reporters asking that question. He threw us out of his shop. It's not surprising that Gauci dreads the prospect of clarifying his past statements. He gave 19 statements to Scottish police between September of 1989 and February, 1991. Those statements are riddled with ambiguities and contradictions. Legal observers say it's unlikely that Gauci will be of any help to the prosecution in the Netherlands. "He would perhaps have to look about 10 years or more older and he would look like the man who bought the clothes. . . . I can only say that of all the photographs I have been shown, this photograph. . . . is the only one really similar to the man who bought the clothing, if he was a bit older . . . other than the one my brother showed me." "I think the photograph in the newspaper may have been the man who bought the clothing. He looks like him." At the time, Talb was in fact a leading suspect in the bombing of Pan Am 103. He had alleged ties to the terror group first suspected in the Lockerbie bombing, the PFLP-GC. His accomplice in the Copenhagen bombing was seen coming and going from a PFLP-GC safehouse in Germany, according to West German police documents. Airport records showed that Talb visited Malta in the fall of 1988. A raid of his apartment in Uppsala, Sweden turned up an appointment book with the date, December 21, circled. At one point, Lockerbie investigators had so much evidence against Mohammed Abu Talb they sought to extradite him from Sweden. "Was there compelling reason to look at Abu Talb? Absolutely," says Vincent Cannistraro, who headed the CIA's Lockerbie investigation at the time. "And we did do that. Did the law enforcement folk on both sides of the ocean have enough compelling evidence to go before a judge? I'm told they did, but I don't know the nature of that, and I can't speak to it." Talb refused requests for an interview. He's serving a life sentence in Sweden for the Copenhagen bombing. Lockerbie investigators cleared him of the Pan Am bombing for reasons US and British officials say they can't discuss. Besides his vague identification of Megrahi as the man who bought clothes for the bomb suitcase, Tony Gauci gave statements that directly contradict the prosecution's case. The Mary's House proprietor told police he remembered the sale of the brown trousers because the man who bought them also purchased an odd array of items, seemingly with little regard to their size or desirability: a baby's sleeping garment; a tweed jacket that had languished on the rack for five years. "It was as if anything I suggested he buy, he would take it," Gauci is quoted as saying in a police statement. Gauci could not remember exactly when he'd made the sale to the strange-behaving Arab, but he told police he did recall a couple of facts that could be helpful in pinpointing the date. It was raining, Gauci recalled; that's why the customer bought an umbrella. Gauci recalled that the Arab had come in just before his shop's 7 p.m. closing time, and that he, Tony, was alone in the shop that evening; his brother, Paul, who ordinarily worked evenings too, was home watching a soccer game on TV. According to police transcripts, Gauci's brother, Paul, told investigators that the most likely date of the purchase was November 23, 1988, four weeks before the bombing of Pan Am 103. He recalled staying home one evening to watch a soccer game between Rome and Dresden; a schedule showed those two teams played on the evening of November 23. And Maltese weather data confirms Tony Gauci's memory: rain fell that evening. But the indictment of the Libyans says defendant Megrahi bought the clothes at Mary's House not on November 23 but on December 7,1988. The problem: the Rome and Dresden soccer teams played in the early afternoon, not in the evening, on December 7. And Malta did not get a trace of rain that evening.